When you visit Europe the next time, choose to fly with Icelandic airline Icelandair, and take upon their offer to visit Reykjavik, the capital of Iceland, by utilizing their free stopover. Icelandair is your top choice for cheap flights to Europe, even if visiting Iceland doesn’t interest you (yet). A few years ago I flew for the first time with Icelandair. I simply chose them for their cheapest price to fly from New York to Scandinavia, and was very happy with the airline, and knew from trip one that I’d be flying with Icelandair again. The only bad thing about the low airfare is that even the 5 hour flight from New York to Reykjavik doesn’t include a meal in the price, but since I took the night flight, I didn’t really miss food anyways. And unless you fly first class, the airplane food, well, it’s airplane food, even the meals you can buy on Icelandair for the extra cost. On my first flight with Icelandair I wanted to get to know the airline a bit better, and read their on board magazine and watched all of those promotional videos you can watch on board. You can’t help but want to know what kind of country is the mysterious Iceland when you fly with Icelandair, and what it would be like to visit. Icelandair does an excellent job marketing their nation, and in fact Icelandair won the “Best Marketing Company of the Year” award for 2011, and it was presented to the company by the president of Iceland, Olafur Ragnar Grimsson last November. This small airline has grown the past few years and done an excellent job marketing themselves and their home nation Iceland at the same time. On my first flight with Icelandair I saw all of these amazing videos of horseback riding on the beach, visiting hot springs and gorgeous untouched nature. The airport in Keflavik (Reykjavik) is modern, welcoming and gives you another sneak peak to Icelandic culture and design, and got me wanting to go back. If you are flying to Europe anytime soon, I highly recommend Icelandair, and taking advantage of the free stopover Icelandair has to offer, and visiting Iceland. 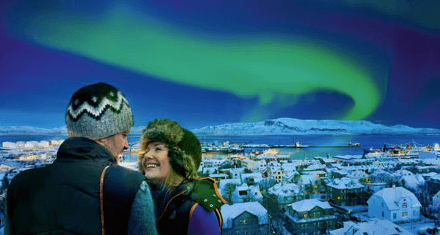 You can book your flight using the special booking engine on their site, and you’ll notice that the price will be the same with the 1-7 day stopover in Reykjavik. The stopover really comes with no extra cost. I was afraid that since we had to take our luggage and then check it in again we wold be forced to pay a luggage fee for the European flight. We had our max amount of 8 pieces of luggage and carry-ons, and we didn’t have to pay anything for them during the entire trip. I guarantee you will also like the flight prices they have to offer. Even if you’d prefer to use an airline that you are a member of. I’m a Delta Skymiles member, and have a Silver Elite status and I would have gotten two free flights to Europe with Delta with all of the points we’ve collected. It was cheaper to buy four flights from Icelandair than buy two flights from Delta! Now you understand why I was determined to visit Iceland..? Hello, we run a little cozy guesthouse 20min away from Reykjavik city center, in a very beautiful place in the country side. Very many of our guests are people who take the Icelandair offer for stopover and injoy the wonders our country offers on their way to or from the USA.